Originally published under the title, "Obama's Model Partner Thinks Israel, U.S., Biggest Threats." 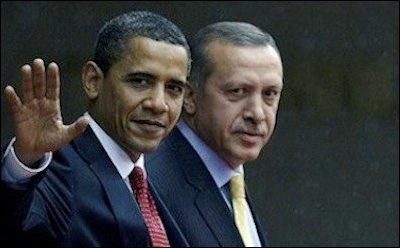 President Barack Obama with his Turkish counterpart in 2009. From a historical point of view, relations between Turkey and the United States are multidimensional and based on mutual respect and interest. As NATO allies, Turkey and the U.S., carry out their bilateral relations on the basis of universal values, including democracy, freedoms, respect for human rights, rule of law and free-market economy. During the visit [in 2009], President Obama defined Turkish – U.S. relations as a 'model partnership' and the leadership of both governments reached a high level consensus to bring the bilateral economic, commercial, investment and technologic dimension of the relationship to a level proportionate with political, military, and security cooperation. The concept of 'Model Partnership' reflects the advanced level that Turkey and the U.S. have reached in the relationship. Really? Does Obama still think he found a "model partner" in a country that once was a staunch ally of both his country and of NATO? Over one-third of Turks view the U.S. as the greatest security threat to their country. A recent study on the Turks' foreign policy perceptions reveals that Obama's model partner nation has a totally confused mind -- not just over Turkish-American ties, but also over its own identity and security concerns. The research, unveiled on May 27 by a team of academics from Istanbul's Kadir Has University, shows that the Turks view the US as the second biggest security threat to their country (35.3%, just after Israel with 42.6%). Reflecting a similarly negative mindset, 32.3% of Turks think that the U.S. has colonial ambitions. According to the same study, however, 74.3% of Turks think that Turkey is cooperating with the U.S., and 44.3% think the cooperation is of a military nature. Further, 53.3% of Turks think Turkey "has no problems with the US." Interesting mindset: More than half of Turks think their country has no problems with the U.S., and nearly half think their country has a working military cooperation with the U.S., yet they view the U.S. is the second most dangerous country to the security of their country. Even more strangely, the U.S. ranks second in the list of countries with which Turks believe their country should most cooperate in overseeing foreign policy. 14.2% of Turks cite the U.S. as necessary for foreign policy cooperation, compared to 12.4% who say Turkey should cooperate most with Islamic countries. 42.6% of Turks think the biggest security threat to Turkey is Israel (only 0.4% view Israel as a friendly country). By contrast, they view the European Union (12.8%), Armenia (7.2%), and Cyprus (3.9%) as the biggest security threats after the U.S. According to a popular saying in Turkey, "A Turk has no friend other than a Turk." It might sound paradoxical that 12.8% of Turks view the EU rich club as the biggest security threat while 47.5% of them approve of Turkish accession into the EU. If not paradoxical, it might at least sound paranoid, given that the combined population of the three countries they cite as top their security threats after the U.S. -- Israel, Cyprus and Armenia -- have a combined population of barely 12 million, compared to Turkey's population of 78 million. But this paranoia should be normal in a country where the popular saying "A Turk has no friend other than a Turk" is a national dictum. The study also found that 38.7% of Turks think that their country has "absolutely no friends." That is the "Turkish delight" -- a bit bitter, but very Turkish. Nearly two-thirds of Turks think that their national identity is either "Islam" or "Middle Eastern" while nearly half of them wish to join Europe's "Christian" club (only a quarter of Turks view themselves as "European"). Ironically, Turkey is located in one of the world's most violent, unstable and turbulent regions. While the Turks' most tangible threats are their Muslim neighbors -- and the Islamists they have overtly or covertly supported in their country's "neighborhood" -- they tend to look for enemies in unlikely territories. This is not the first time that research has found that the Turks seem confused. Once again, the Turks seem to feel lost. They seem not to know which countries pose a real security threat, where their country or they themselves belong, or where they should belong.